The pixie is a bold and drastic cut that few women are brave enough to try themselves. Cutting off all but a few inches of your hair is a courageous move and a pretty major commitment. That being said, many women who risk a pixie cut come to love their ultra-cropped style and love the freedom of not having longer locks to fuss with every morning. Getting a pixie cut doesn’t have to be such a scary risk, as long as you do the right research before heading to the salon. 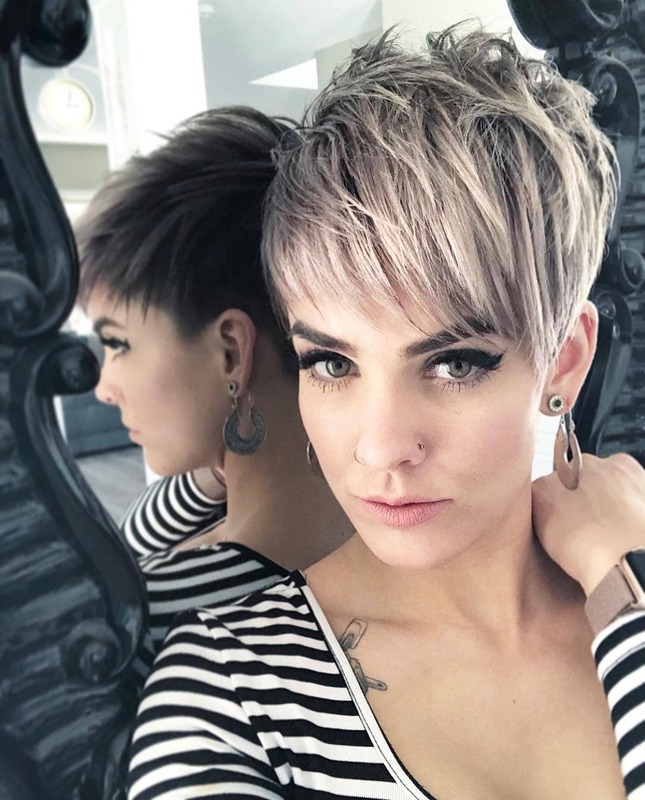 If you think you might want to brave the scissors yourself, check out these ten on-trend pixie cuts to find the style that’s most flattering for you and most compatible with your lifestyle. 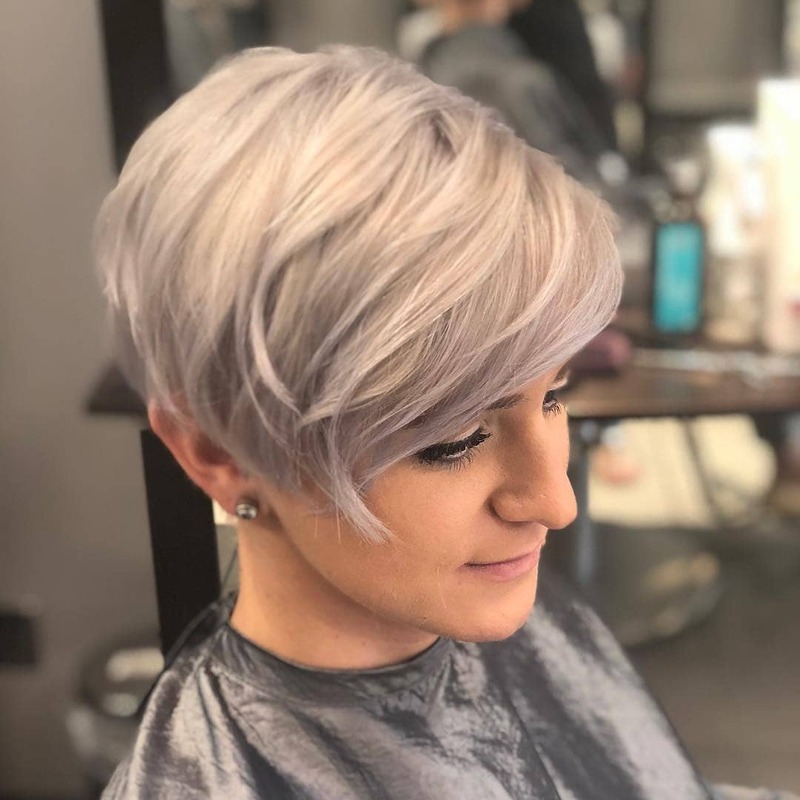 With edgy combed-forward layers in front and fringe cropped at sharp angles, this pixie is a spunky style with a feminine finish. To style this edgy pixie, start by combing your front layers forward while your hair is still damp. Let your hair air-dry or blow dry it straight. Then, use a texturizing spray to tease up your back layers and add volume to your style. 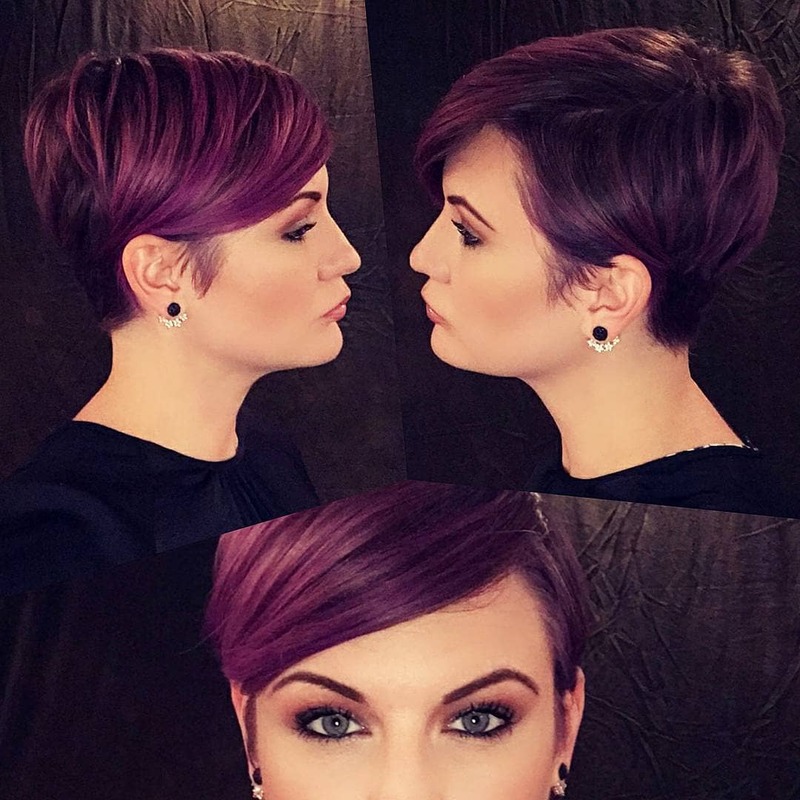 This polished pixie is stunning in a gorgeous, rich shade of violet that flatters almost any skin tone. Achieving the ultra-sleek style of this pixie is simpler than it seems. When your hair is damp, draw a deep side part using a fine-tooth comb. Comb your hair behind your ear and use a lightweight gel to keep it in place. Add shine serum for a smooth, polished finish. This spiky style is the perfect pixie cut for women with thinner strands who want more volume in their hair. Its buzzed sides add a bold edge, while its spiky top layers give this cut plenty of effortless volume. You don’t need any heated styling tools with this haircut. Let your hair air-dry, then add a texturizing spray to your top layers to add volume and a tousled, piece-y finish that lasts all day long. 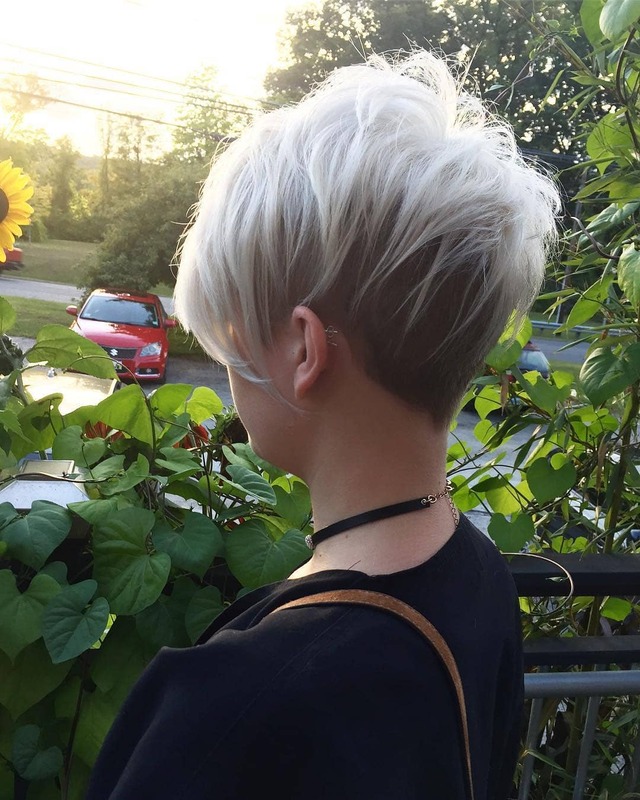 Stay on-trend with this ultra-modern white-blonde spiky pixie style. Its short side layers make this cut super manageable, while longer layers on top give it an edgy yet feminine finish. When styling this cut, use your fingers to comb a lightweight gel or texturizing spray through the top layers of your hair to achieve the messy-on-purpose, spiky look in the picture above. 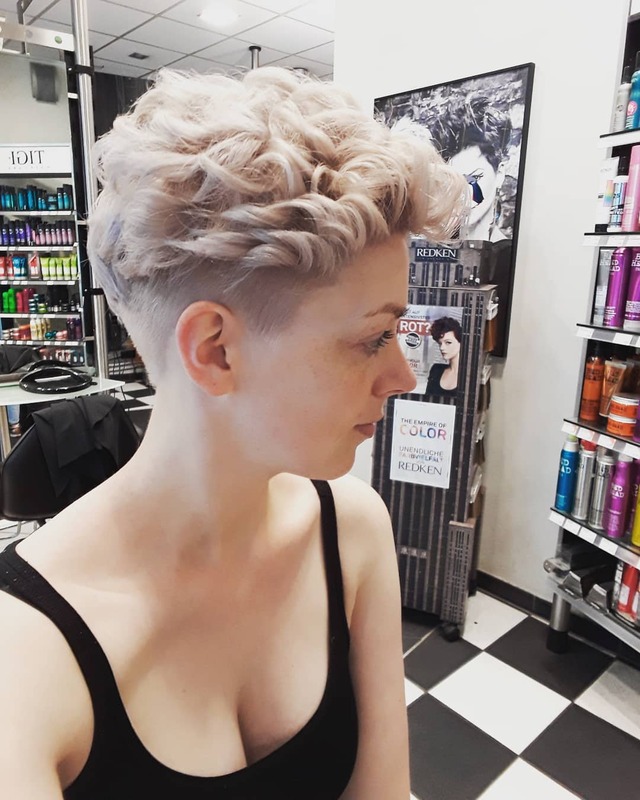 With long layers in front and a buzzed undercut, this bleached pixie is a very unique and trendy cut that stands out from other similar pixie styles. Use a comb to tease up the top layers of your hair to add volume to this style. If necessary, flat iron the front layers of your hair to create long, sleek side fringe. Finish styling with a small amount of hairspray to keep your hair in place all day. 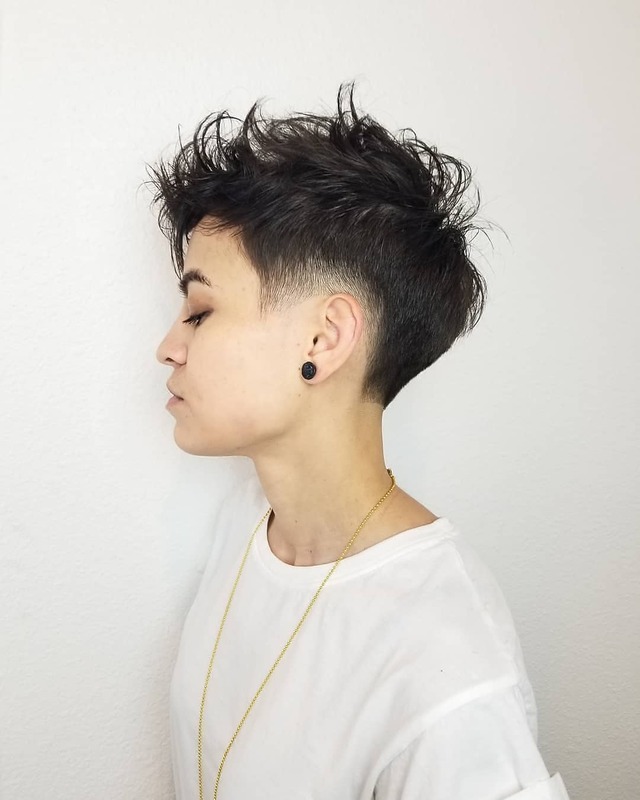 This textured pixie cut is perfect for women with wavy or curly hair who don’t want to have to fuss with a blow dryer or flat iron every morning. You can style this pixie in minutes. Leave your buzzed sides alone and comb a smoothing serum through your top layers to add volume and a sleek, shiny finish to your style. This tousled pixie is a versatile, messy-on-purpose style that always looks effortlessly on-trend. Despite its longer layers, this pixie cut is very easy to manage. Just use a texturizing spray to separate your ends for a trendy, tousled finish. 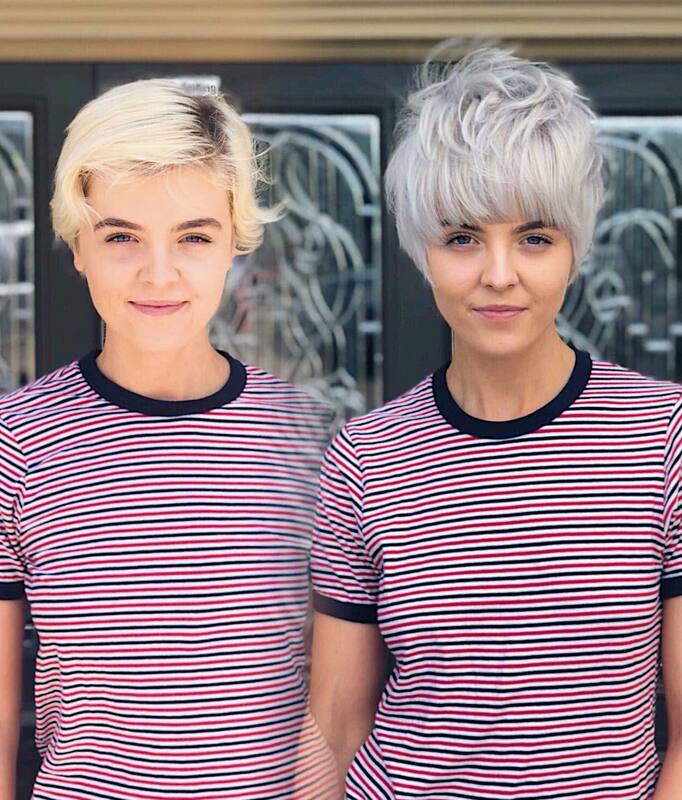 The stunning before and after shots above show just how much eye-catching style a brand-new pixie can add to a drab, ho-hum haircut. 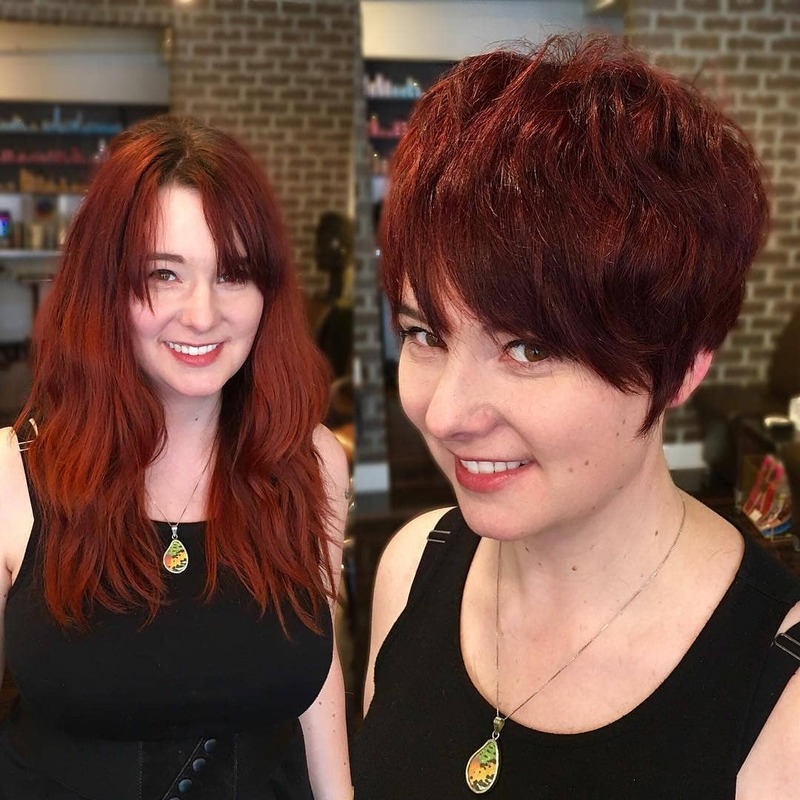 Styling this dark red banged pixie is effortless. Use a blow dryer and round brush to brush your hair forward for a smooth, voluminous finish. Add a lightweight texturizing spray to your bangs to achieve the piece-y style in the picture above. This bleached, sideswept pixie cut is the picture of polish and professionalism. Its smooth side part and long, delicate sideswept bangs in front give this cut an ultra-sleek and streamlined finish. Styling this polished pixie is easy. Start by drawing a deep side part in your hair. Use a damp comb to smooth your hair to one side. Add a smoothing serum and shine spray for added polish. There is definitely a limit to how many ways you can style a short pixie cut. 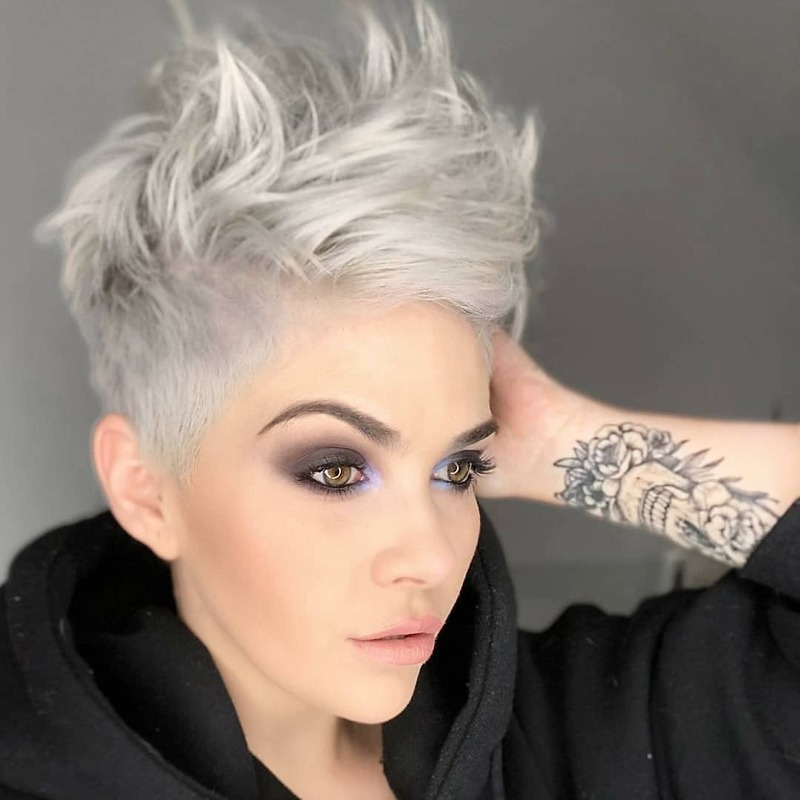 This bleached, white-blonde pixie, however, is a very versatile cut that isn’t limited to just one style. 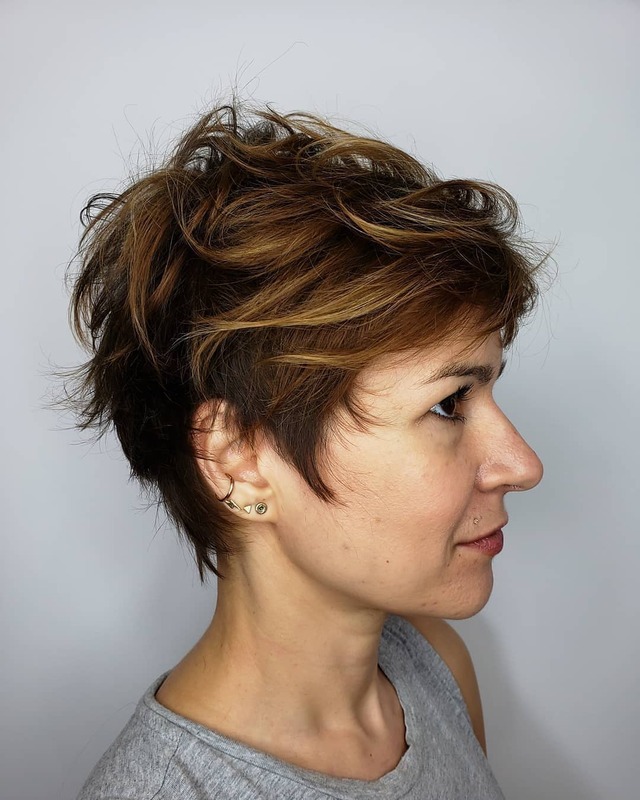 If you want to keep your hair out of your face, just draw a deep side part in this pixie cut and smooth both sides back with a lightweight texturizing spray. Or, create a delicate banged look by combing your hair all the way forward. Avoid helmet hair by adding a small amount of texturizing spray to tease and define your shorter, wispier layers.